This map illustrates shelters in the area of the Rukban border crossing on the Syrian-Jordanian border. 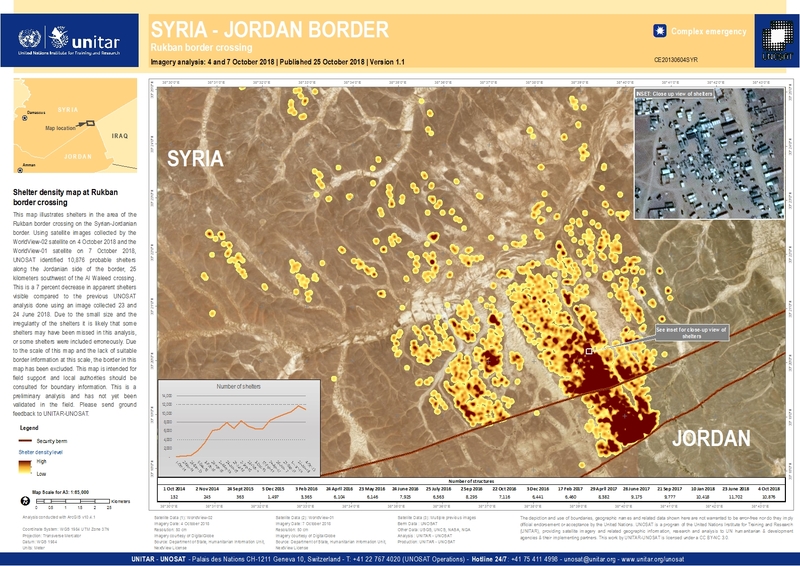 Using satellite images collected by the WorldView-02 satellite on 21 January 2019 and the WorldView-01 satellite on 4 October 2018, UNOSAT identified 7,735 probable shelters along the Jordanian side of the border, 25 kilometers southwest of the Al Waleed crossing. This is a 29 percent decrease in apparent shelters visible compared to the previous UNOSAT analysis done using an image collected 4 October 2018. Due to the small size and the irregularity of the shelters and the gap in the satellite imagery collection it is likely that some shelters may have been missed in this analysis, or some shelters were included erroneously. Due to the scale of this map and the lack of suitable border information at this scale, the border in this map has been excluded. This map is intended for field support and local authorities should be consulted for boundary information. This is a preliminary analysis and has not yet been validated in the field. Please send ground feedback to UNITAR-UNOSAT.